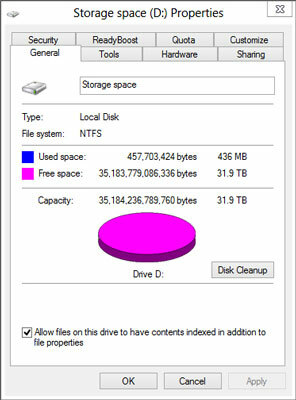 Even though you can set up Storage Spaces in Windows 8.1 with just two hard drives — your C: system drive, plus one data drive.— you don’t get much benefit out of it until you move up to three drives: internal, external, eternal, infernal, whatever. For this exercise, those two hard drives should have absolutely nothing on them that you want to keep. Because they will get blasted. Guaranteed. 1Hook up your drives and then go into File Explorer and verify that Windows has identified three drives. Here, there are three drives. The C: drive has the Windows system on it; C:’s the boot drive. The other two have miscellaneous junk that you don’t want to keep. 2Bring up the Control Panel (right-click the lower-left corner of the screen and choose Control Panel); tap or click System and Security, and then tap or click Storage Spaces. Equivalently, you can go to the Metro Start screen, type storage spaces, and look under Settings. 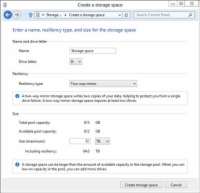 If you choose either Storage Spaces or Manage Storage Spaces, you see the Storage Spaces dialog box. 3Tap or click the Create a New Pool and Storage Space link. 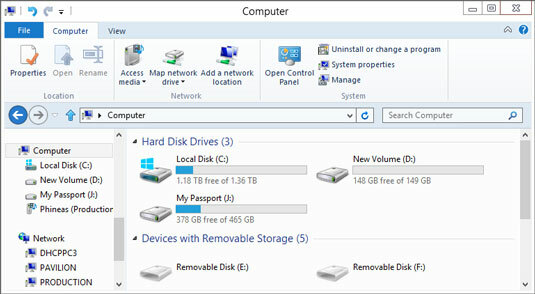 You have to create a storage pool first — that is, assign physical hard drives to Windows available pool of hard drives. 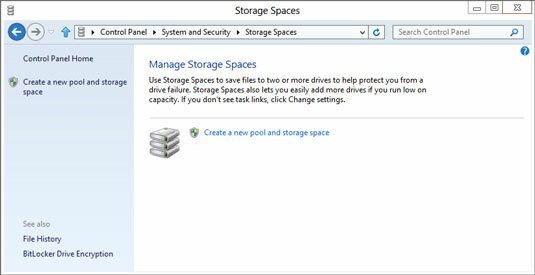 Windows offers to create a storage pool. 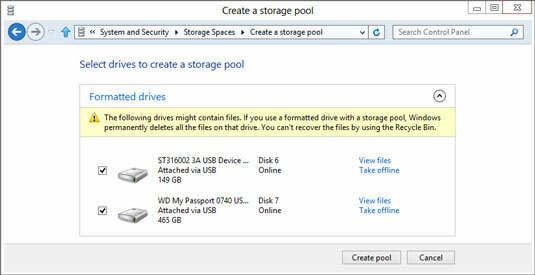 4Select the check boxes next to the drives that you want to include in the storage pool. Note that if you accidentally select a drive that contains useful data, your data’s going to disappear. Irretrievably. You can’t use Recuva or some other disk scanning tool to bring back your data. After the drive’s absorbed into the storage pool borg, it’s gone. 5Tap or click Create Pool. 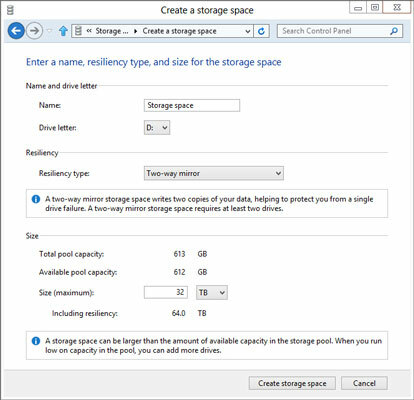 Windows whizzes and wheezes and whirs for a while, and then comes up with the Create a Storage Space dialog box. 6Give your Storage Space a name and a drive letter. You use the name and the letter in the same way that you now use a drive letter and drive name — even though the Storage Space spans two or more hard drives. You can format the Storage Space drive, copy data to or from the drive, and even partition the drive, even though there’s no real, physical drive involved. You are given four choices — no mirroring, two-way, three-way, and parity. 8Set a logical size for the Storage Space. The logical size of the Storage Space can greatly exceed the available hard drive space. There’s no downside to having a very large logical size, other than a bit of overhead in some internal tables. Shoot for the moon. 9Tap or click Create Storage Space. Once again, Windows whirs and sets up a freshly formatted Storage Space. 10Go back out to File Explorer and verify that you have a new drive which is, in fact, an enormously humongous Storage Space. If it weren’t for the fact that you just created it, you probably wouldn’t be able to tell that the new Storage Space isn’t a real drive.